You could cut your ridge roll into smaller sections and treat this like a step-flash the same as you would with a closed hip. Over lap the piece being installed with the piece and slate of the underlying coarse, so each course is flashed, you follow? This would be much easier to do with lead or even copper I would imagine. I would used something with more flang than that roll your showing now. If you are using IWS you don't need to be slating. If they want the original condition it should be step flashed at the corners. Also, your new field slates look like they are overlapping at the rain line about halfway up, to the right of the downspout. If so, that's a miserably lazy mistake. 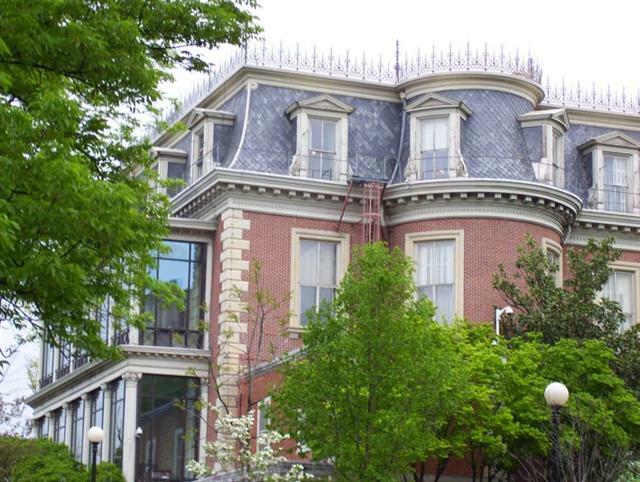 I need help detailing a ridge roll flashing on the outside corners of a curved mansard re-roof project. The existing conditions are as follows: the existing slates are attached over solid sheathing and 30# felt, stainless steel ridge roll flashing is attached to a wood nailer at the mansard ridge, the slates abut the roll flashing and are nailed through the flashing to the sheathing, the exposed sides of the slates next to the flashing are caulked to seal. Please see the first two photos for the existing condition. My concern is the lack of cover at the abutment of the slate to the flashing and the reliance of caulk to keep it weathertight. Though the pitch is steep, water has found its way to the nails in some areas and ultimately to the sheathing and beyond. 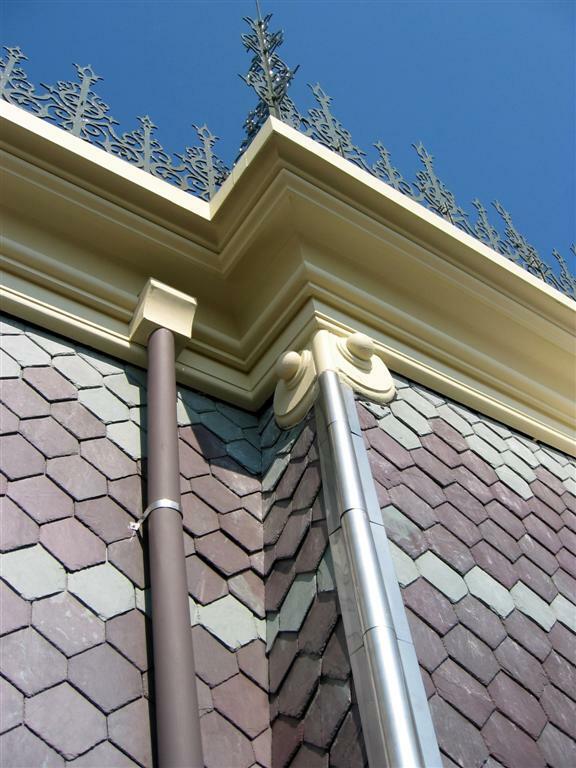 We initially used a standard ridge roll flashing profile in the re-roof. The flashing is currently attached with its legs OVER the exposed edges of the slate affording a higher degree of protection. Historic Preservation has criticized this installation and requires us to return it to the original configuration. My concern is how to do this without the problems associated with the exposed slate edges. Does anyone have a solution? 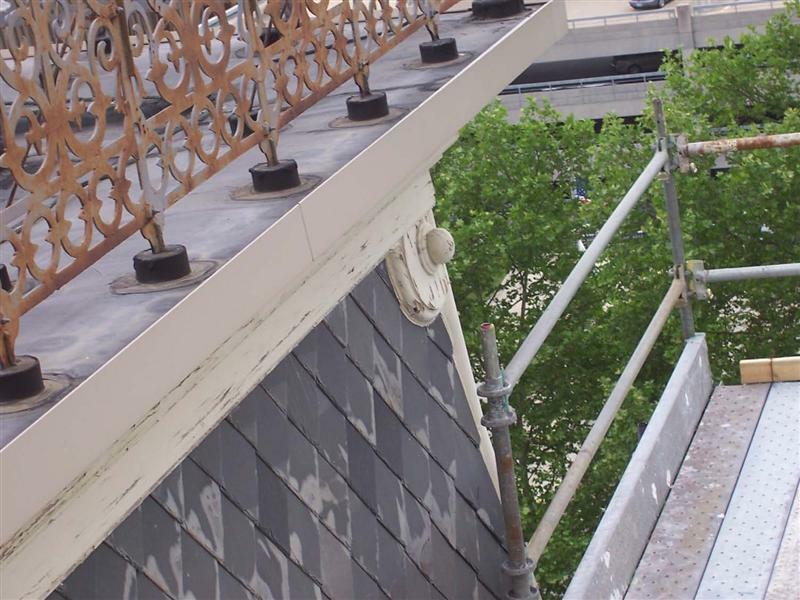 Are we faced with installing Ice & Water shield underneath the roll flashing and then nailing the slates through both the flashing and the I&W? Is there some other detail that will solve this problem and keep the original thin profile? Is the existing detail adequate? I appreciate your thoughts and ideas.